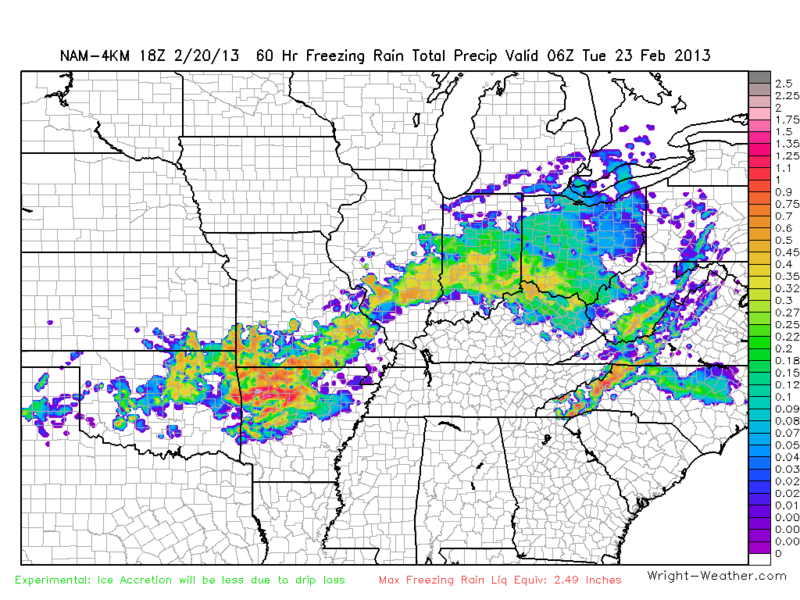 Here are the snowfall, freezing rain and ice pellet projections from the NAM-4KM WRF-NMM 06Z model run. 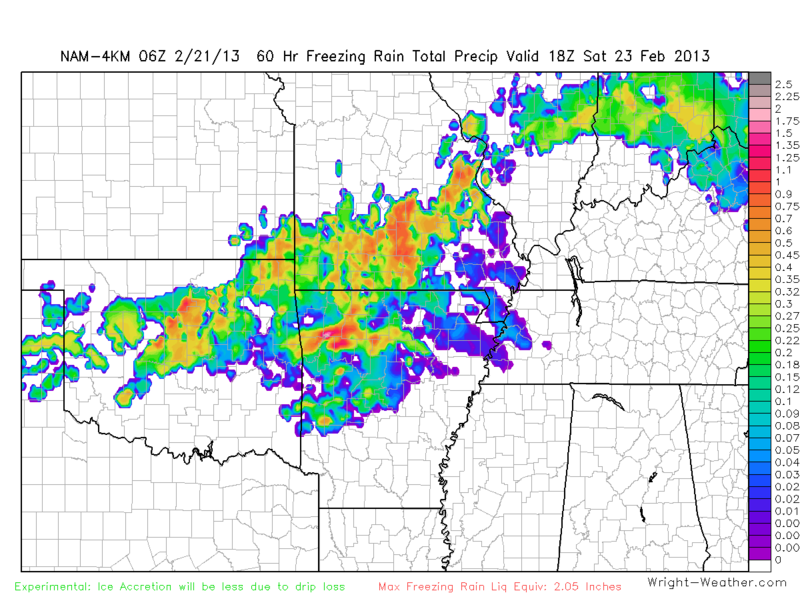 Freezing rain will be a big problem across Northern Arkansas and the data also suggest that Western NC may experience some buildup of ice. An experimental product we are working on in the Wright-Weather labs is a freezing rain accretion product. 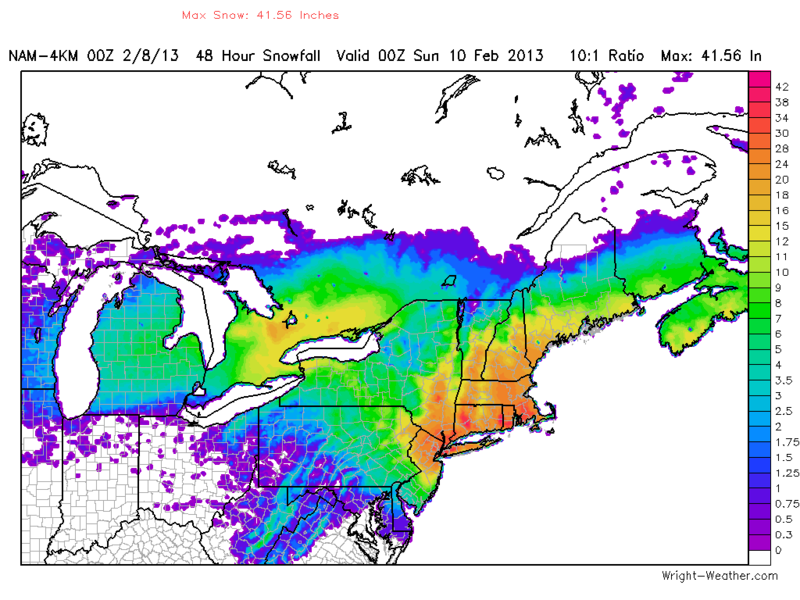 This is the 60 hour, pretty much direct model output, graphic from the NAM 4KM WRF-NMM. 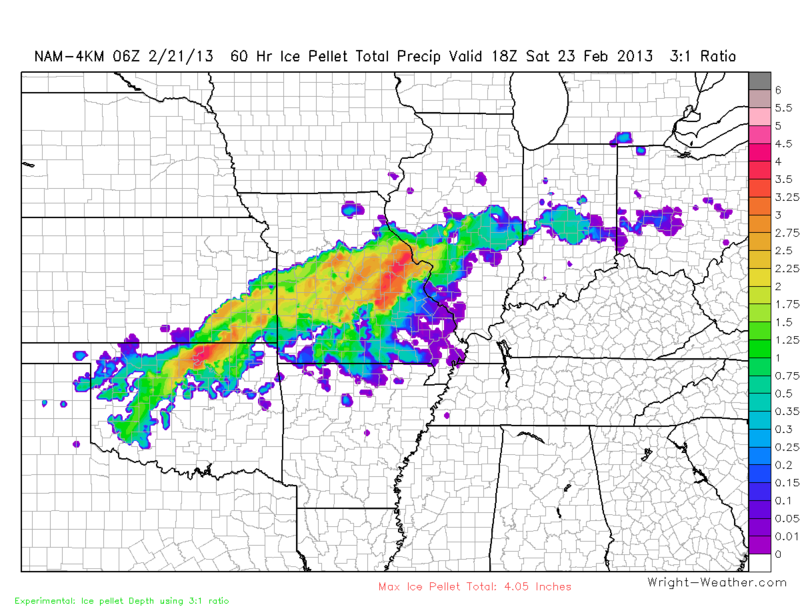 Keep in mind that actual ice accretion amounts will be less than the totals on this graphic. This is due to drip loss, that is freezing rain that drips off surface before freezing. Drip loss is highest when the temperature is closest to freezing and the precipitation rate is high. 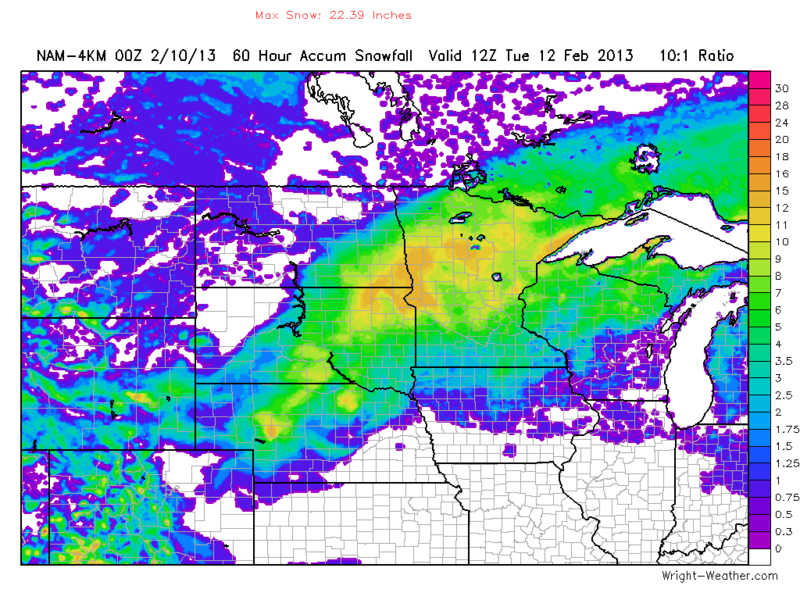 Here is the NAM 4km Nest WRF-NMM model’s Snowfall using a 10:1 ratio. A new winter storm with blizzard conditions will affect the Northern Plains this Weekend. 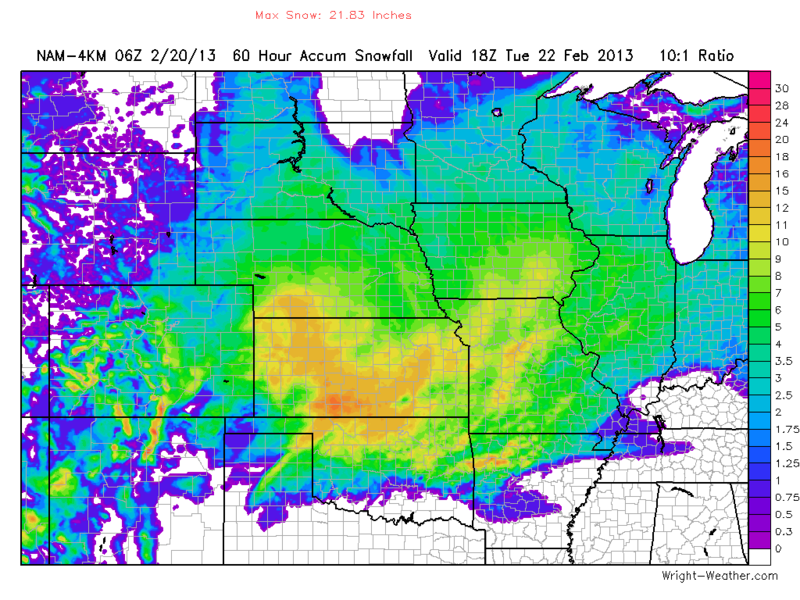 Here is a snowfall accumulation map from the NAM-4km. Major Winter storm will bring Blizzard conditions to the Northeastern U.S.
A powerful winter storm will bring heavy snow and strong winds to the Northeastern U.S. on Friday. The models are in good agreement. 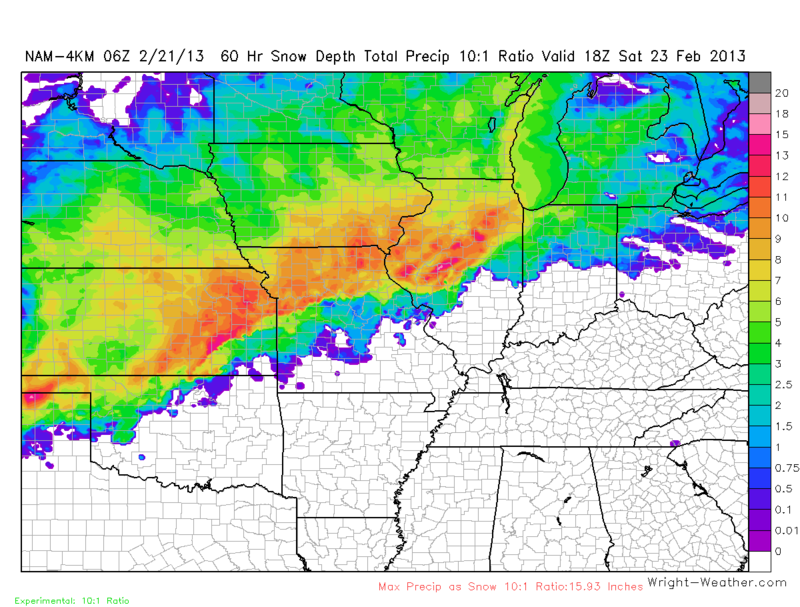 The NAM-WRF 4KM is producing snowfall totals in excess of 3 feet. In fact, the latest 00Z run tonight is producing amounts of 41.5″ using a 10:1 snowfall ratio. as it moves up the east coast. Blizzard warnings are in effect for parts of the New England coast.